U.S. scientists believe they may have cracked one of the great biofuel conundrums. They have turned a thick soup of algae into a mix of crude oil, gas, water and plant nutrients in less than an hour. That is, they have taken 60 minutes to do what Nature does—at great pressures and temperatures—over millions of years. Better still, the researchers at the U.S. Government’s Pacific Northwest National Laboratory (PNNL) believe they have invented a continuous process that is not only faster than the experimental methods pioneered so far for making oil from natural growing things, but cheaper and more self-sustaining. So far, the PNNL reactor handles only 1.5 litres of algae an hour. But, the team reports in the journal Algal Research, somewhere between 50 percent and 70 percent of the algal carbon is converted to potential energy in the form of crude oil, which in turn can be made into aviation fuel, gasoline or diesel. The leftovers are clean water, a mix of fuel gases and nitrogen, phosphorus and potassium that can be used to nourish more algae. It helps to be able to recover fuel gases, because there are still serious energy costs. The system has to run at 350°C and a pressure of 3,000 pounds per square inch. The experiment, part of the U.S. Department of Energy’s National Alliance for Advanced Biofuels and Bio-products, eliminates two stages in the laborious laboratory process of converting algae to oil. 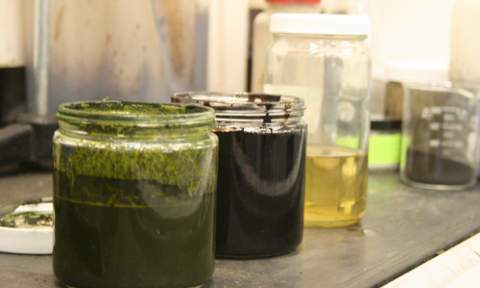 Researchers don’t have to expend fuel to dry the algae before sticking it in the reactor. Instead, the mix goes into the reactor as a well-stirred slurry with the consistency of pea soup: as much as 90 percent water, the rest algae rich in lipids (molecules which can store energy). And the scientists don’t have to process the mix with solvents to get the oil out of what’s left of the algae: gravity does that for them. Both steps will reduce the costs. That the team can also recover something that could be turned into natural gas, and therefore energy, is one bonus. Another is that they can get back water and nutrients to sustain the process. The big engineering challenge, however, will be to scale up the system to something that could ever compete commercially with the stuff that gushes from an oil well. The PNNL scientists may have accelerated a natural process, but the petroleum industry can still benefit from the huge reservoir of natural crude that has been stewing and brewing in the rocks over vast periods of geological time.